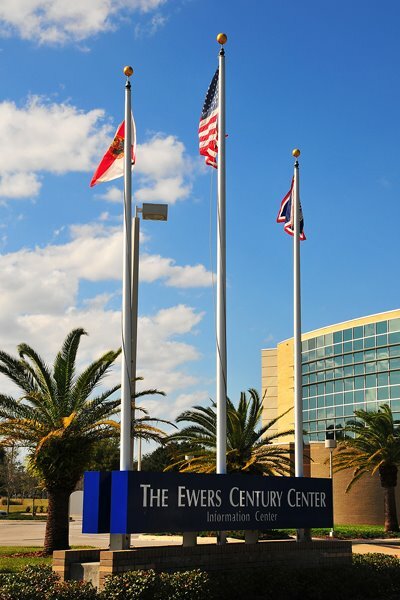 Central Florida Community College is located on the main drag through town. It is a vibrant institution, offering a quality education to thousands of students every year. The college also provides numerous educational and cultural opportunities for local residents. Good first shot. Welcome to the dailycityphoto community. I have a quetion about the flags. I don't know I do not know the flags that are next to the U.S.A. Could you tell me what these flags? Thanks for the comment and the welcome. The flag on the left is the Florida state flag. The one on the right - hmmm - I'm not sure, but I think it is the City of Ocala flag. I guess I'd better be sure I know what the heck it is I'm photographing! One more thing...I checked out your blog. It is very nice! Where in Spain is Murcia? I'm including you in my blogroll...perhaps you would reciprocate? This was the top link on Google for community colleges in Florida that offer a photography program. Would you care to share a little about it? Hi Kyle...thanks for stopping by...unfortunately, I know nothing about CCFC's photography program...I'm sure a check of their website would help direct you to the proper office or site.